A world-class trek, that takes you through beautiful wooded valleys, along cold, clear mountain rivers, and into the soaring, snow-capped peaks of the Himalayas. The trek culminates in a climb to the high mountain glacial region of Everest Base Camp. The trek is justifiably famous for being both challenging and rewarding, and yet remains open to most who have the stamina and determination to make it. 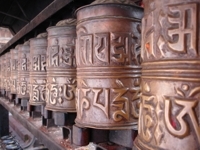 You start this tour in Kathmandu where we take you on a guided tour of this fascinating and culturally rich city, including the famous Durbar Square and Swayumbunath Stupa. You then travel by road to Jiri where your trek to Everest Base Camp begins. This is a lodge-based trek, which gives you the chance to spend time meeting and talking with other trekkers and guides in the evenings, as well as enjoying a little more comfort at the end of each day. From Jiri the trek spends the first 10 days climbing gradually through the Himalayan foothills, crossing several deep, wooded river valleys before following the Dudh Khosi up to Namche Bazaar, an historical Sherpa trading centre of the Khumbu Region. From here you enter into the Sagarmatha National Park area, and tremendous mountain scenery surrounds your trail as you make your way towards the high mountain glacial region of the Everest Base Camp. Snow-capped mountains close around as you follow the Khumbu Glacier up to Gorak Shep (5,288m), and ascend Kala Pattar (5,545m). The view of Nuptse, Ama Dablam and Everest, from the summit of Kala Pattar, is truly breathtaking. 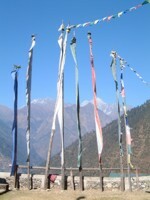 The following morning, you trek up to the Everest Base Camp area, from where so many expeditions have begun. From Base Camp you retrace your steps back to Lukla, along the way appreciating spectacular views of peaks from angles you may have missed on the way up. From Lukla you catch the morning flight back to Kathmandu where you have a little free time to do some last minute shopping or a little more sightseeing around the city and surrounding valley. You can join one of our small-group departures on this tour, or arrange it with us privately, or use it as a base for a tailor-made itinerary. You can also extend the tour with various options which allow you to try some white-water rafting, or visit one of Nepal's national parks.